Controversial businessman Wicknell Chivayo's marriage has shaken with the wife and in-laws taking the marital woes to social media. Chivayo's wife Sonja Madzikanda took to her Instagram to vent over her 'marital problems' while describing her husband as a psychopath. The two arrived at Miss World Zimbabwe finals held over the weekend separately and each minded their own business during the pageant. They were also sitting separately. Sonja posted five videos, the night they were supposed to attend the pageant finals together and in the videos, she revealed that she had bumped into a girl that Chivayo had almost cheated with before. She also revealed how she is at odds with her sisters-in-law and about how she is supposed to seek forgiveness and be a better person who doesn't reveal her problems on social media. "On top of that, his sisters are here sending me voice notes about how I should seek forgiveness and be a better person, so I catch all sort of feelings, I've been through enough, I've been through social humiliation and problems in the relationship. "So I'm not in the mood to actually talk to him (Wicknell), so I get home, he's upstairs and has been blowing up my phone and I'm not answering, he goes and sees my car parked outside and leaves me at home for Miss Zimbabwe, after all of this," said Sonja. Madzikanda went on to lament over how (some) men ill-treat women in marriages and encouraged women to speak out. "Whoever told you that this lifestyle was gold and glittery lied to you, I'm telling you my pre-Miss Zimbabwe drama, marrying a psychopath who thinks that stuff like this is cute. Men, do better! "There are people who are going to say don't talk about your marital issues online, listen this stuff is real and women are out here being oppressed in this thing called marriage, oppressed," said Sonja. In her last video, Sonja remarked the Maserati that was in front of her and asked if any of her followers knew the owner, and if anyone did, they should give them her number. Wicknell yesterday said he could not comment on the issue. "I cannot comment on the matter. So stop calling me," he said before hanging up. Wicknell's sister Moe Chivayo, also took to Facebook to reply to claims by Sonja on Facebook saying that she does not care about their family and that Wicknell always said whoever gets pregnant will get married first which happened to Sonja. The post read 'Wicknell always said whoever gets pregnant gets married first that means out of all his concubines, you won because you were pregnant not because you changed him. No one will ever change him and I want you to remember this as long as you live. If you married him because you loved him, you would really be broken but no, you don't love that guy, you wanted that lifestyle and it kills you that he didn't live up to what you expected. At the end of the day, dust yourself and do go to parties because you are not heartbroken, you are financially disappointed but be glad he bought you that land rover and sends petty EcoCash to your phone and you be able to get sh*t done and show up acting like a boss'. In a video she posted, Moe Chivayo accuses Sonja of making things up, encouraging her to leave Wicknell if she really is disgruntled by his conduct while ironically playing Shinga Muroora by Jah Signal in the background. Chivayo married Sonja last year and they have a son together. 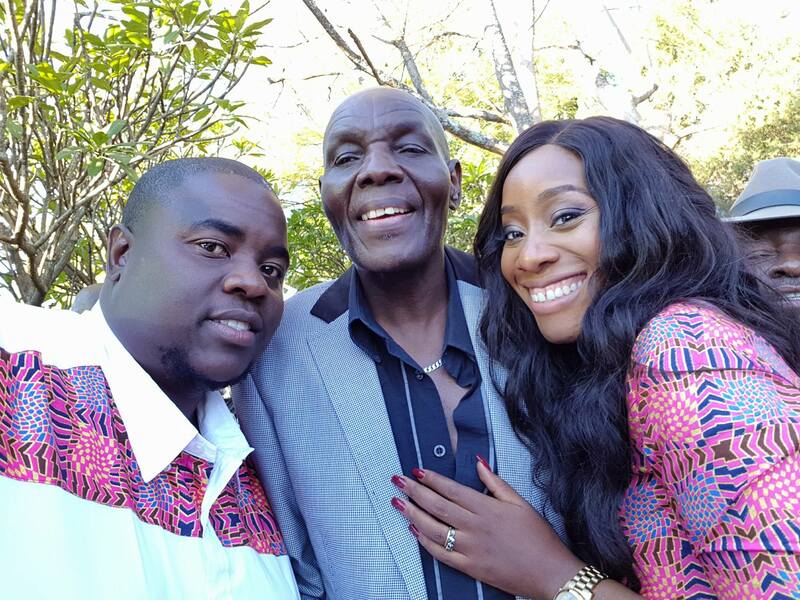 The couple married in July last year after Chivayo had vowed that he will never marry a Zimbabwean woman. The lobola ceremony was lavish and Chivayo had said he was expecting that his in-laws would charge him $50 000, but they charged him less which reportedly saw Chivayo paying for everything in full.